Does ESN pay in spring wheat? Results from two on-farm sites in eastern Ontario showed no advantage in grain yield or protein content with the use of ESN in 2011 (see Table 1). There was also no significant difference in residue soil nitrogen levels. As expected there was also no impact in the percentage of Fusarium Damage Kernels (FDK%) or in the grain toxin levels (VOM ppm). Table 1 – 2011 ESN on Spring Wheat from two on-farm sites in eastern Ontario. The Ottawa-Rideau Regional Soil & Crop Improvement Association project evaluated the economic benefits of ESN® Controlled Release Fertilizer, or Smart Nitrogen (N) use in spring wheat production. This was a three year project that started in 2009. ESN is a new product that uses a micro-thin polymer coating to encapsulate a nitrogen granule. This coating is to protect the N from loss to the environment and releases it based on temperature and soil moisture, theoretically when the crop needs it. In 2010, only one of the two sites yielded about 4.5 bushel per acre more yield grain using full rate ESN blend as compared to the straight Urea. The ESN treatment also increased grain protein about 0.5% in 2010 the ESN-Urea blend, however this was above the maximum protein premium of 12.5% for Hard Red Spring Wheat. There was no increase in grain yield or protein in either of the 2009 or 2011 growing seasons. Residual soil N levels where similar between all treatments in each of the three years of the project indicating no environmental benefit to the ESN fertilizer. one-half the grower standard rate. The one-half grower standard rate was used to determine if ESN yielded more grain or higher protein in spring wheat under a lower available nitrogen situation. At harvest, plots were weighed and measured for moisture and test weights. 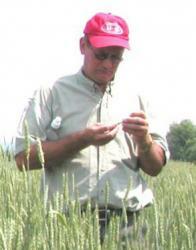 Spring wheat samples were collected and the grain analyzed for protein.